In October 1987 Paul Stevenson wrote an article, 'Sunday Picnic Uniforms', for Military Modelling describing the colourful dress worn by the Union and Confederate Armies at the first battle of Bull Run (Manassas), 21 July, 1861. 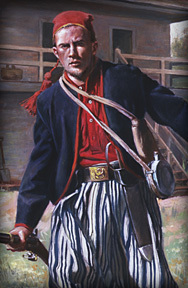 'Sunday Picnic Uniforms' was the catalyst which inspired the research and development of the complete orders of battle for every company that was part of the for the Armies of Northeastern Virginia, Potomac, and Shenandoah during the Manassas Campaign, Virginia, between 16 and 22 July, 1861. The article describes the uniforms of the Union and Confederate Armies which were, apart from the few regulars in the Army of Northeastern Virginia, composed entirely of citizen soldiers. Most of these were volunteers, but a great many had belonged to existing militia units all with their own mode of of dress, blue and grey being the most common. The 'picture book war' started and ended at the first battle of Bull Run (Manassas) on 21 July, 1861. 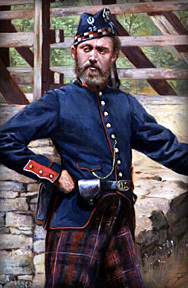 The various styles of dress have been tabulated for most of the individual units in a chart which lists head-dress; coat, tunic, shirt, etc; collar; cuff; shoulder straps, shoulder scales or epaulettes; trousers; trim, braiding, kepi band, etc; trouser stripe; gaiters, as Zouave units often with leather jambiéres; equipment straps, belts, etc. Membership information on the Confederate Historical Society write to the Secretary Andy Mowatt, 60 Stroma Way, Glenrothes, Fife, Scotland KY7 6RD. If you have information regarding brigade or company assignments and/or organisation please contact Jonathan Soffe at info@firstbullrun.co.uk. The above painting, 'Capture of Ricketts' Battery', is by Sidney E King. 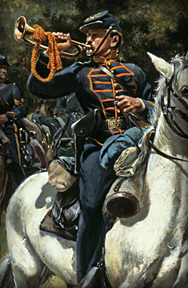 The painting is oil on plywood, and is displayed in the Henry Hill Visitor Center at Manassas National Battlefield Park.